Drive-In was commissioned by Unity Savings for their new Beverly Hills office. At the corner of Wilshire and La Cienega Boulevards (known as "Restaurant Row"), it was located on the former site of Dolores Restaurant, famous for being one of the original drive-in restaurants in Los Angeles. Dolores had been torn down against the will of its owner and long-term patrons and was replaced by a large office building. Unity Savings happened to be one of the tenants. Because a savings and loan relies on the support of local residents and businesses, Lakich thought it would be exciting and appropriate to create a tribute to Dolores Restaurant. For research, she set out to soak up the atmosphere of some of the remaining coffee shops which had been built in the 1940s and '50s. It was at the Dolores Restaurant in West Los Angeles that she found a vinyl chair that became the basic shape of the large aluminum background. It holds a 3-dimensional copper boomerang, one of the zoom shapes of the 1950s. The original Dolores drive-in had copper counters and doors with portholes. Because it had been designed for cars to order window service, a car was essential. She chose the '57 Chevy for its quintessential beauty, it's fairly 2-dimensional contour, and its symbolic relation to America of the 1950s—the Age of the Automobile. She found the quarter panel at the shop of a guy who restored only '55, '56, and '57 Chevys. She saw his ad in a magazine called "CHEVY." When she called him, he said "I've got a '57 sitting here and I'm getting ready to cut it up. Which part did you want?" Lakich recalls that it was like buying a piece of meat. 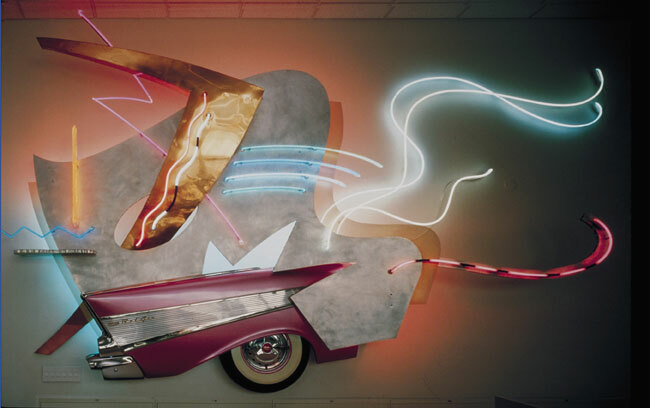 Aluminum, copper, brass, '57 Chevy quarter panel, tire, neon crackle tube. 216 x 120 x 24"